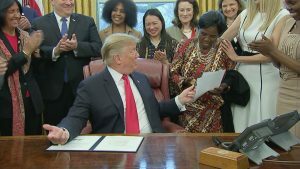 WASHINGTON, D.C. (CNN) – President Trump signed a presidential memorandum Thursday launching the Women’s Global Development and Prosperity Initiative. The initiative focuses on three things: helping women thrive in the workforce by improving access to quality education and skills training; continuing efforts to fund and support women’s entrepreneurship; and working to identify and reduce barriers to women’s participation in the global economy and promote improved practices. The goal is to help at least 50 million women by 2025.